The HRS-10 Hair Regrowth System is a specialized 3-step hair restoration treatment that uses advanced technology to stop hair loss while encouraging the growth of thick, healthy hair. One of the biggest causes of hair loss is the increase of dihydrotestosterone; this hormone, also known as DHT, can disrupt the growth of hair follicles, resulting in areas of thinning hair. HRS-10 hair treatment is composed of a special shampoo, conditioner, and hair growth serum that is used daily to improve the appearance of your hair. Our New York hair surgeon is proud to offer this specialized 3-step solution for patients seeking a solution to hair loss. Can achieve thicker, healthier hair. Reduces hair thinning while also encouraging new hair growth. Non-surgical hair restoration requires no healing time or recovery. Can restore hair volume & moisture to improve shine. HRS-10 for hair growth is a non-invasive hair restoration routine that is performed at home. First, a volumizing shampoo is used to allow for a clean and optimal environment for hair growth. By using the shampoo, patients can also expand the shaft of each individual hair follicle for a healthier look and shine. Next, a replenishing conditioner is applied to reinforce your roots and restore moisture to your hair. The third and final step of the HRS-10 system is the application of a specialized hair growth serum that is massaged gently into the scalp. Made with biomimetic peptide and red clover extract, this serum is clinically proven to reduce the production of the DHT hormone and slow down thinning hair. Together, these three products can stimulate the growth of a thicker, fuller head of hair. 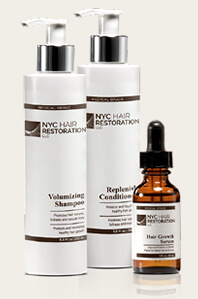 Step 1: Volumizing Shampoo Creates a healthy environment for the regrowth of hair follicles. Adds fullness, volume, & shine to your hair. Step 2: Replenishing Conditioner Made from nourishing panthenol formula. Reinforces & protects your roots while also guarding against breakage. Step 3: Hair Growth Serum Unique hair restoration solution combines biomimetic peptide & red clover extract to reduce thinning. Slows the production of DHT hormone to allow for efficient & proper hair growth. Results will vary depending on the specifics of your hair loss. However, many patients see results within 30 days of initial use. You can expect improvements to areas of thinning hair in the months following your hair loss treatment. Can The HRS-10 Hair Regrowth System Be Combined With Other Hair Loss Treatments? Yes. The HRS-10 Hair Regrowth System may be used with NeoGraft, PRP hair therapy, Lasercap LCPRO, or hair transplant surgery, depending on the specifics of your procedure. 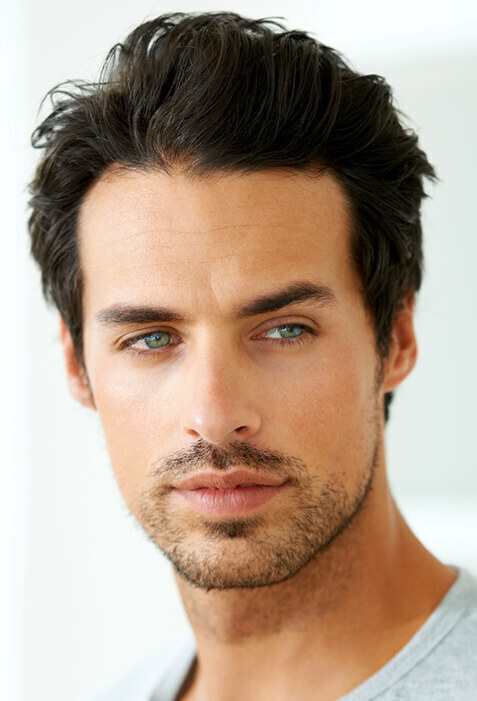 Your NYC hair surgeon will discuss which hair restoration options are right for you during your consultation. How can I find out more about HRS-10 Hair Restoration? Dr. Elie Levine, Dr. Jody Levine, our technicians, and friendly staff will be happy to meet with you to discuss the HRS-10 Hair Regrowth System. Please call our office at 800.755.HAIR (4247), or make an appointment online for a personal consultation in our New York City office.